I’m in the same position you were in, taking a little break while playing DQXI. I found something really neat though. So, I was randomly curious if there were any cool Japanese Dragon Quest patches. You know either cool improvement hacks or the DQ equivalent to FF6 T Edition. Among other things I found a Japanese translation patch of Dragon Warrior. This might not sound like anything special, but this hack managed to RESTORE THE ORIGINAL LOGO! From the screen there, it looks like maybe they removed the detailed coastlines, possibly for the logo? If we could see what they did, extrapolate the logo and keep the English, this might be beneficial to both our projects. I still need to try it myself. I’m curious if they restored the Puff Puff in Rimuldar. Anyway, patch link here if you want to try it yourself. There are actually quite a few patches for the NES and SNES Dragon Quests. I remember a SNES DQ3 one that added post game story too. When I get home I'll try to put them here and maybe we can get them uploaded to the site for archival purposes. Choppasmith, what a glorious find! Everything we need is in this hack; it's just a matter of locating and copying over the relevant code and tiles. Looking over their rom in a tile editor, the reason they took off the coastal tiles is because the kana required more room than the English alphabet and they used that space. If I manage to make any progress, I'm going to do the work as a separate patch so you could just apply to yours. Let's see if I can get anywhere. I really should have been taking this approach all along. They moved a *lot* of stuff around in the rom. I don't think I'm going to be able to locate where the code is that needs replacing. There is very little room for additional tiles in US version too. My famicom style graphics hack may be helpful in this regard because I have more tiles I can cannibalize once I can do the requisite changes to the code. Oh I miss this, crap. That title screen pic I knew that wasn't in the original game. I don't understand why Nintendo made this game design to make change that looks so different than it was from japan. I like that title screen from japan, because from SNES version that is how they designed it better than it the original version when it was released. That's very odd, but in the same time that makes it better if its for localization. I guess. Actually, Nintendo couldn't use the name "Dragon Quest" in America. At the time, there was a tabletop RPG called "DragonQuest" (notice how there's no space between the words) floating around, so a different name had to be used. Due to American copyright law, Square Enix wasn't able to use the name Dragon Quest until 2002. I started working on some more updates for Dragon Warrior 3 and the first thing I did was update class names. Solider -> Warrior, Pilgrim -> Cleric, Wizard -> Mage, all very similar what the SFC English patch translators did. I'm debating most on the fighter, since the fact he is a hand to hand guy was never conveyed very well by "fighter." I'm thinking about going with Monk. Any strong thoughts let me know. On the same point, I'm stuck with something minor but important. Those little two letter class abbreviations that appear under your character names in battle.. I can't find those in the rom for the life of me and the rom maps I've looked at don't indicate. If anyone could point me to where those are so I can update the initials, please do! The official localizations for all the modern games use "Martial Artist", which is obviously too long for the text box. Regarding the class abbreviations: they're actually separate glyphs in the character set immediately after the capital letters. Never played the NES version but hoping to hack it for my RE-Quest series what the heck are the fancy t-x and the Br, Ma, Bi, and Me tiles for? @Choppasmith, They are abbreviations of the class names of the characters that show up in the battle screen and some menus. If I'm changing Soldier to Warrior, I have to also change the Sr to Wr. @Reiksa, thanks for the tip. Just editing the tiles themselves is the way to go. I'm having a weird issue. I use tile layer pro for my tile editing--I know its out of date but I had some issues getting newer software working correctly. When I go through the rom, I'm able to locate sprite graphics easily and I adjust with - and + keys to get them to display properly if they are garbled. 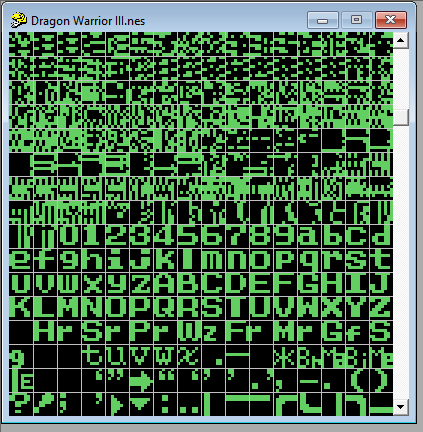 For the text however in all 4 dragon warrior games, it's always garbled, no matter how much I adjust with + and -. Not sure if it's something I'm missing or if I should be changing my editor. Click this link for what I'm seeing. @Choppasmith: I actually have no idea, don't think I've ever seen any of those glyphs used in the English version. And I don't think they exist in the JP ROM at all. @Chicken Knife: TLP's what I'm used to as well, so you're in luck. You need to switch to 1BPP mode rather than NES mode for the DW fonts to show up/be editable. Thank you thank you! These kinds of simple solutions for rom hacking issues are so very precious and rare. Please continue to hang around this thread. For the script, I don't plan on doing much with it. I'm definitely restoring puff puff dialogue in Assaram / Ashlaham. I'm also going to restore Japanese town names that were changed like Kanave --> Kazave. Does anyone know of any other badly translated, censored or excessively localized text that I should be looking at in DW3? Only thing I can think of is status effects. in DQ3 Mobile, they're with the class abbreviations. But even then those don't make sense. Weird, but neat. Suppose if you needed some Squishy tiles for new stuff, those could work then. I forget which tiles it was (unfortunately), but a while back when I tried hacking the mobile version enemy names into the NES version and I had to try using squishy tiles, there were some tiles that would cause the game to hard-lock if used. Sorry I can't be of more help in remember which ones they actually were - it's been years, at this point, and I don't have that ROM file anymore. I'm making rapid progress on DQ3. Spells, item names and monster names are all updated to a more literal Japanese translation. Working on the script. In the mean time, I came across some information on sprite pointers and I need some advice. I assume the sprite pointers simply reference the tiles themselves and if I could get the rom address for the tiles, I could repoint as needed in order to do some cool things like restore coffins and fix the occasional alterations I had made in porting over Japanese sprites. I've fooled around in tile layer pro and it doesn't seem to have a way of showing me the rom address of the tiles. I certainly can't make them out in a hex editor. What's the best way to do this? Is there a different system that the NES uses to display sprite tiles? I would appreciate if someone could provide an explanation. I have to figure this out in order to make the sprites in DQ1 more identical to the famicom version. Big news guys. I just finished inserting my freshly written retranslation of pretty much the entirety of Dragon Warrior II. I've tested it with my own playthrough and at this point it should be bug free and quite polished. The script is a fairly direct translation of the Japanese Famicom script based on x_loto's translation document as well as my own research and an enormous number of questions to my Japanese speaking friends. I've taken great pains to make the text both accurate, fluid and easily readable. I'd love any feedback. Huge thanks to abw for supporting every step of the extraction and insertion process. The link is also on the first post of this thread, and that is the link that will be kept up to date. Not this one. Now if I could only get someone to help me with switching out the ghosts of dead party members for the original coffins. The coffins are good for 2. They don't reflect individual character palettes like in the Japanese version--all of them have the Prince of Laurasia palette but it all looks fine. Encountered a bug where the coffin palette switches to all blue in Rondarkia/Rhone. After experimenting with fixing all 100 instances of 010101 appearing in the rom, the 100th entry turned out to be the one and I was able to correct the palette to that of the standard coffin. I got some time on my hands, so I'm gonna try 'em out. Thanks for doing the first game. Thanks! Would love any feedback. FYI I'm about to post a 1.01 update to DQ1. After finishing II (well, not really. I never finish) I did another go through the first game and found about 20 text lines I wanted to improve along with doing some further polishing up of the title screen. I'll post the new link on the first post of this thread later tonight. The update to the main hack page will take some time I'm sure. I wanted to provide a brief update. After doing a total line by line retranslation of Dragon Quest II, I've gone back to my version of Dragon Quest I and realized that I actually left a ton of the script basically the US localization with thees and thous removed, more fluid phrasing, removals of obvious Americanisms like Nestor & Howard as well as adding in censored stuff. I decided that this wasn't good enough. Since I was so pleased with my line by line retranslation of DQII, I thought my version of I should absolutely match it, especially since that's what people will typically play first. The first step was getting the script extracted and insert-ready through abw's fantastic abcde software. That's been done and I'm well underway rewriting pretty much every piece of text from this game. My original version was limited by the length of individual lines so I'm overjoyed to have cast off that restriction. Part of my rethinking has involved moving away from the vestiges of our original localization. Two examples: Dragonlord is now Dragon King. All the talk about the "Dragonlord's minions" has been replaced with the original idea of monster attacks. I've thought particularly long and hard about Red Slime / She Slime which in Japanese is Slime Besu. To the Japanese audience, Besu sounds very close to Mesu which is a word indicating a female beast. After weeks of deliberation, I decided to take the female animal form Slimess (IE Lioness) and gently tweak it in the same way Horii tweaked Mesu. That gives us Slime Bess. I like this because it achieves the same affect of the Japanese--much more than the contemporary "She Slime". Slime Bess sounds both unique and distinctly female. I can't say exactly when I'll have this done, but sometime within the next couple weeks I assume.